Picky: How much room would you normally have with improvising the strumming patterns? Lyle: Depends. Sometimes a different rhythm part will "break" the groove. You don't want to be a "groove killer" when jamming. 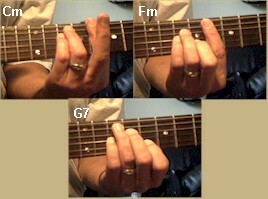 That's why in the video example I start by play a simple 1 beat strum for each chord to avoid breaking the groove. Lyle: How's everyone doing so far? jax: cool i like it! Lyle: C natural minor is also the relative minor, related to the Eb major scale. This means you could also use the Eb major scale to improvise with. Lyle: Many guitar players struggle when playing the Eb major scale because it's not a key they are used to playing in. This jam is a great way to get in extra practice playing in this key of Cm - Ebmaj. ico: Is it because they are used to the E major scale instead? Lyle: Well, most guitar plays don't play in the key of Eb, Ab, Db. Lyle: They'll play in E, D, C, A, and G.
Lyle: Here's how I played the solo from the lesson sample. It's made from the C natural minor scale and the harmonic minor. Lyle: The combination of the clean, neck position pickup sound, the use of octave riffs, and the sliding into the note riffs really help give this the smooth jazz sound. jordan: Lyle, did I hear a little SRV style lick in the first half? Lyle: A little blues lick, yes. Lyle: In the blues and rock guitar styles you would be bending lots of notes. In the smooth jazz style you can lay back and just slide into the notes or riffs. jax: Yea dude that is very nice! Lyle: Thanks. It's a fun groove to jam to.